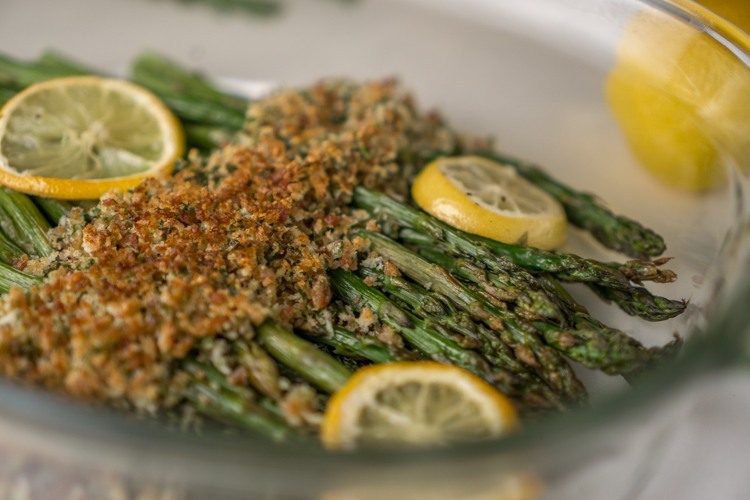 A side dish of perfectly roasted Asparagus with Crispy Topping made with bacon, Parmesan, and fresh parsley. Easy, delicious, and a gorgeous presentation! Preheat oven to 375F. Spray a casserole dish or a baking tray with olive oil and lay out the asparagus in an even layer. Season well with salt and pepper, and give everything a shake to spread the seasoning. Top with lemon slices. Roast the asparagus at 375F for 15 minutes, or until done to your liking. While the asparagus is roasting, cook the bacon. Once it is cooked, place it on a paper towel to absorb extra grease and allow to cool off. Crumble the bacon. In a small food processor, combine the bacon, parsley, lemon juice, and Parmesan and pulse for several seconds until everything is broken up and mixed together. Transfer the bacon mixture to a medium bowl and stir in the Panko breadcrumbs. Top the asparagus with crispy bacon topping, turn on the broiler, and broil for 2 minutes. Watch closely so it doesn't burn. Serve topped with fresh parsley, grated parmesan, and lemon slices for garnish.